The book contains samples of fabric designs. Under each is written how many picks and ends are needed per square inch to create the fabric. A ‘pick’ is a length of weft thread and ‘ends’ is a length of warp thread. The information tells the weaver how to set up the loom to create the fabric. For worsted fabric the yarn would have been ‘combed’ to make the fibres lie parallel, which gives the cloth a smooth surface. 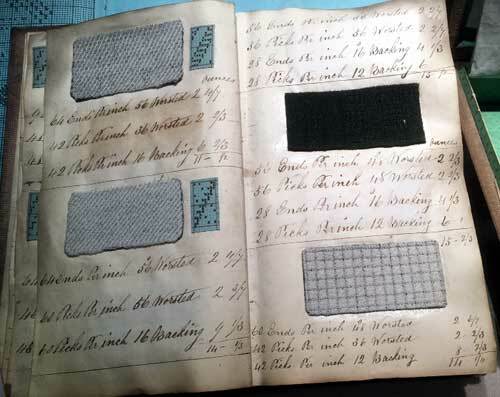 This worsted pattern book is dated 12th May 1876 and belonged to Thomas Day of Newsome. Tolson Museum. 82. 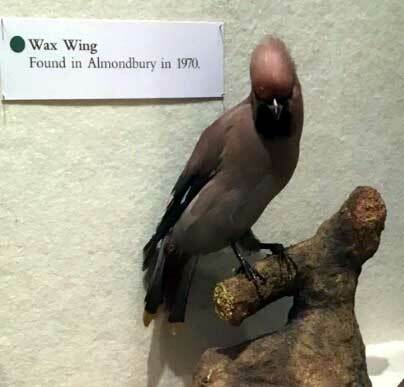 A wax wing which was found in Almondbury in 1970. Natural history specimens used to be collected by local naturalists, like Seth Mosely, the first curator of Tolson Museum. Seth Mosely collected the birds found in the Bird Room. However during the 20th Century laws were passed to protect animals and birds. Since then birds and animals that are preserved by taxidermists will have been found to have died naturally or by accident, such as on the roads. Tolson Museum. 83. Beaker from Ravensknowle Children’s Gala. 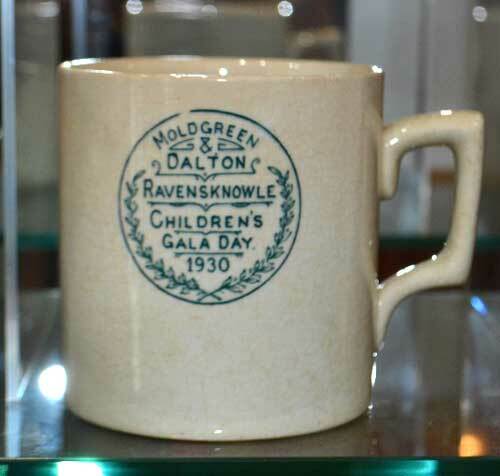 A beaker to celebrate 15 years of a local children’s gala was made in 1930. In the summer of 1915 Mrs Kilburn had organised a fancy dress competition for the children of Senior Street, Moldgreen. This proved very popular and developed into the Moldgreen and Dalton Children’s Gala. It continued to grow and in 1927 a formal committee was established and the Gala moved to Ravensknowle Park. Since them it has grown extensively and become known as the Ravensknowle Children’s Gala. It takes place on the last Sunday in June every year. Tolson Museum. 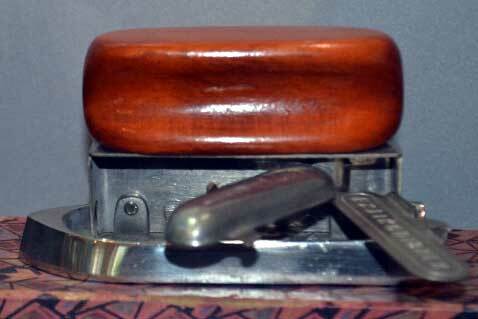 In Victorian times a travelling iron was required by the smart traveller. Such irons are found from the 1850s onwards. Brian Robinson BEM started riding at a club in 1943 when he was 13. He took part in cycle races in England in the 60’s and 70’s. 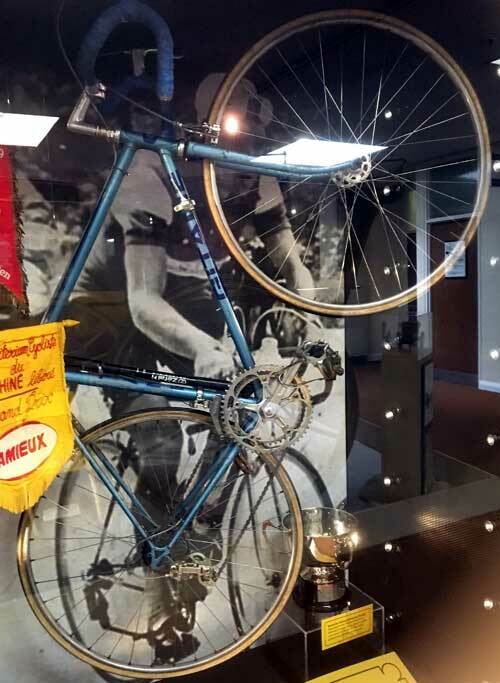 He entered the Tour de France and in 1958 was the first Briton to win a stage. In 1959 he was the first Briton to complete the Tour de France. He was included in the British Cycling Hall of Frame in 2009. For his services to charity and cycling he was awarded the BEM. 86. James Tolson 1898 – 1918. James Tolson grew up in Oaklands, Greenhead Lane, Dalton Huddersfield. He was the youngest son of Whitely and Jenny Tolson. He went away to school and won a place at University College, Oxford. Instead of taking his place at university he enlisted in the Honourable Artillery Company. He was commissioned in February 1917 and then joined the 74th Battery RTA Guards Division. Later in 1917 he was wounded and returned to England to be treated in hospital. On recovering he returned to the front where he suffered gassing. Not deterred he once again returned to the front. He was however injured in action on 20th October in an attack on Solernes. He died later that day. He is buried at the Quievy Communal Cemetery. 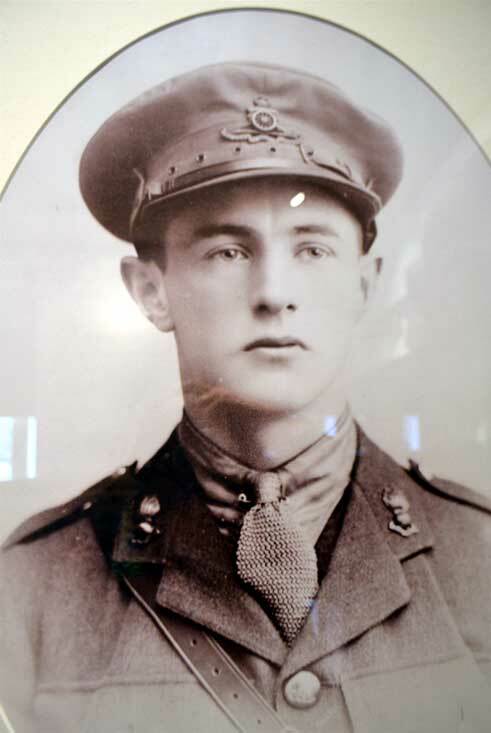 He was 20 years old and died just three weeks before the end of the war. His brother had earlier been killed in action on the Somme. Tolson Museum. These are the fused teeth of the jaw of a shark like fish that was swimming around 300 million years ago. These teeth, which are rather worn down, grew out of the jaw of the fish. This species was called edesfus which means devourer. This is not what you would expect to find so far from the sea, however this set of teeth were found at Rock Mills, Brockholes in the millstone grit shale in May 2016. 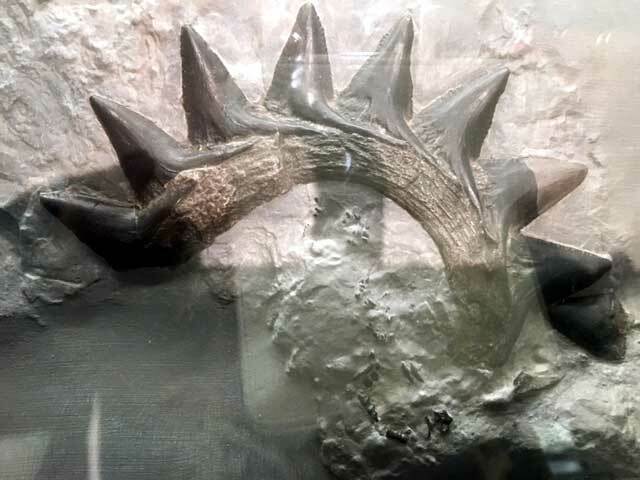 This is a plaster cast of the original fossil, the true item being in the Museum of Practical Geology, now part of the Natural History Museum, London. Tolson Museum. 88. Fossil Wood Faced Clock. This unusual clock was part of the collection of minerals of the late Samual Learoyd and was presented to the museum by his executors. 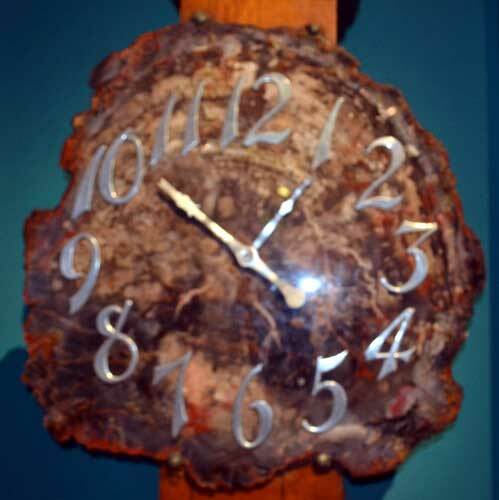 The face of this clock is of ‘solidified wood’ which comes from the ‘fossil forest’ in East Arizona, USA. The mechanism of this clock is reported to have turned the hands of the four faces of the clock in the tower of the Cloth Hall, now in Ravenskowle Park. It was made by Messrs Pearce and Sons, Huddersfield. Tolson Museum. Moquette is a pile fabric used for carpets and upholstery. 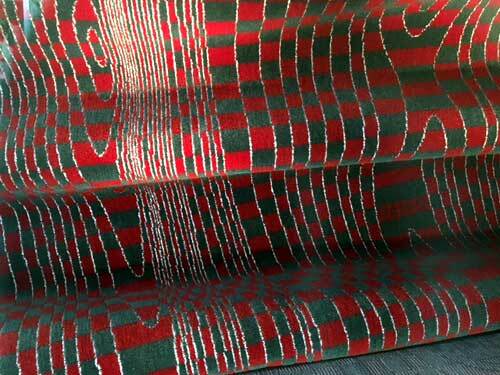 This is a sample of the moquette used on the seats of the relaunched London Routemaster Buses in 2013. This design reflects the contour lines on a map. Moquette is made by Camira Fabrics who are in Meltham. Their headquarters are in Mirfield. This company have been making seat coverings for buses, ships and trains across the world since the 1830s. Moquette is a particularly hard wearing fabric so very suitable for the constant use that seats on public transport receive. A plaque was sent to the next of kin of every man or woman killed WW1. They became known as ‘death pennies. 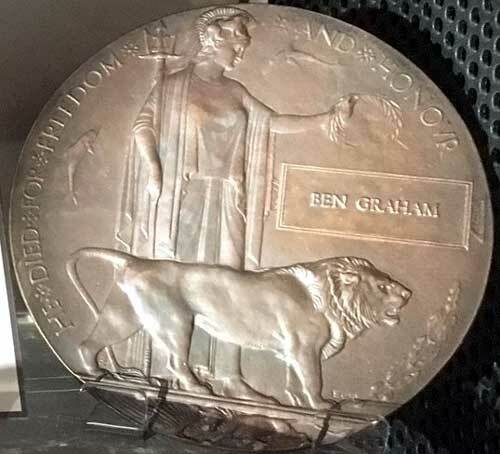 This plaquewas given to the next of kin of Ben Graham of Paddock Royal Engineers. He died on 23rd September 1918 of his wounds while a prisoner of war in Germany. A ‘plaque’ was sent to the next of kin of all British and Empire service personnel who were killed as a result of the war. The plaque is about 5” in diameter and cast in bronze. A public competition decided the design. 1,355,000 were sent to next of kin and they continued to be issued into the 1930s as they included those who had died as a consequence of war.